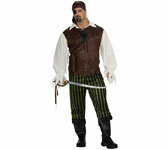 Adult Swashbuckler Plus Pirate Costume. This historically accurate pirate costume. Shirt with attached vest, pants with attached boot tops and headscarf. Size (Adult): PLUS (fits 46-52 jacket size).